Objective: This review will summarize the clinical applications of ADI, from a brief history to its limitations, and will discuss the different ways to deal with the clinical limitations. Method: The structure analysis, cloning, expression, protein engineering and applications of arginine deiminase enzyme have been explained in this review. Conclusion: Recent patents on ADI are related to ADI engineering to increase its efficacy for clinical application. The intracellular delivery of ADI and combination therapy seem to be the future strategies in the treatment of arginine auxotrophic cancers. Applying ADIs with optimum features from different sources and or ADI engineering, are promising strategies to improve the clinical application of ADI. 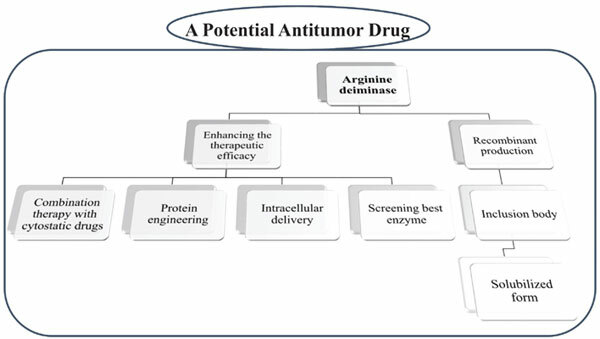 Arginine deiminase, anti-tumor, pegylation, targeted therapy, protein engineering, protein expression.